I have a confession to make. I am terrible at reading and following directions. Take instruction manuals, for example. It isn’t uncommon to find the instruction manual to an electronic device I bought a year ago sitting in a drawer, still sealed in it’s plastic wrap. Instruction manuals, I reason, are for people of lesser intelligence. It may sound like I am bragging mightily here, so I will make a confession too, to even things out, y’know. I don’t know that I can sit and read a manual. I don’t have the attention span. Or the patience. And yet I have both the attention span and the patience to apply sprinkles to a chocolate covered pretzel with a pair of tweezers, to make sure it looks just right. Hmm. Another kind of directions I rarely, if ever, read? Recipe directions. Ironic, I know. I write them, and it’s all I can do to force myself to reread my own to make sure they are coherent. This recipe, however, was different. I read the instructions. Then I read them again. And another time. Then once more. Each time, I thought I had missed something. It simply didn’t make sense that it could be quite so simple. But after four times I gave up, and realized that I had a goldmine of a recipe on my hands. This is, quite literally, the simplest recipe I ever made. Preheat oven to 425. Line a jelly roll pan with parchment paper. Bake 10-14 minutes, or until set. The mixture will be bubbling. Remove from oven and set aside to cool completely. When bars are cooled, melt together the chocolate chips and shortening. Spread over bars, using a rubber spatula to smooth it out. Immediately sprinkle with chopped nuts. 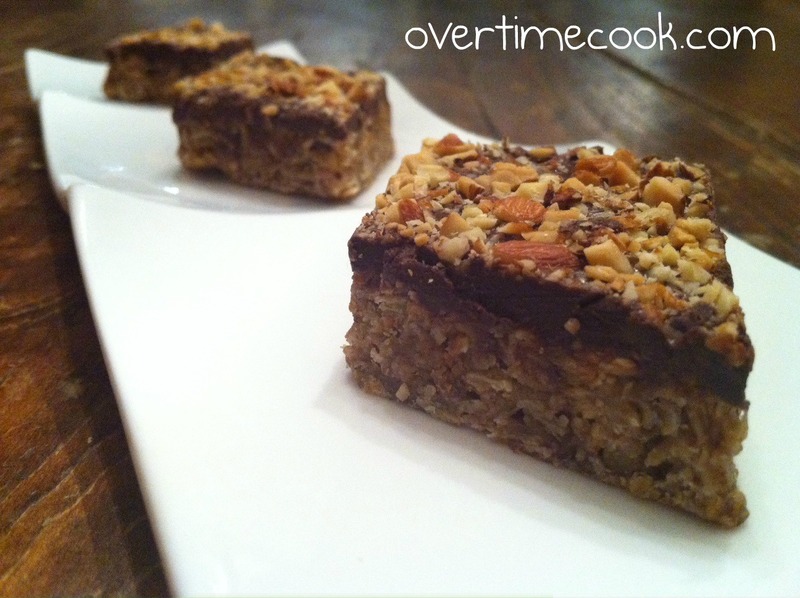 Place in fridge to cool, then cut into bars. wow, I agree, definitely easiest recipe ever. looks yummy. This one has my name all over it. We buy and consume copious amount of oatmeal — my husband just brought home more today, and I’m already planning how to finish it before Pesach. DEFINITELY making these! I was going to make Nutella cookies this weekend but I think I’m going to try these for a change instead! I remember seeing a link to it somewhere- where did you get it? 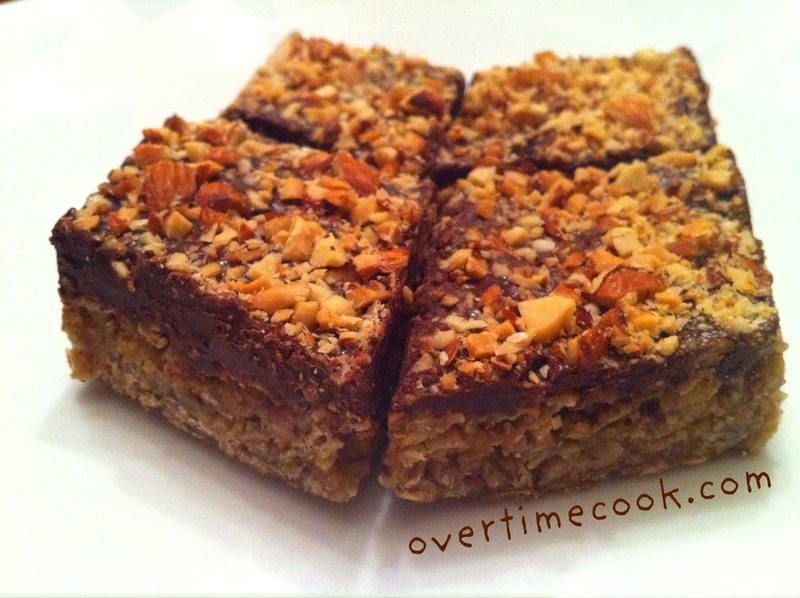 Oatmeal and chocolate are my two favorite baking items and I’m always looking for a way of using them together! Thanks for the excellent recipe! You think peanut butter could find its way into this recipe or would that just be too much? I’ll have to try it and let you know! Should these be stored inside or outside the fridge? Thank you so much for posting this! I cut this recipe from a magazine about 15 years ago and loved how quick and easy it was, until I lost the recipe. If you are short of time you can sprinkle the choc chips on top as soon as they come out of the oven and then spread them as they melt, then add the nuts on top. I SO need to make these (and ASAP!) but have a crucial question: what size is the jelly roll pan? A standard 10×15 or a 9×13 or ? I’ve googled and can’t find the info anywhere and would so appreciate your reply :-)! I am glad you like the recipe! I thought a jelly roll pan was a fairly standard size- I guess I was wrong! It is 10×15. I made this just now and it is yum! But it made more than I expected – do you know if it freezes well? Thanks! I froze them and they were great! Glad you enjoyed! I made these (planning for my daughter’s vort…. ), and checked them after 10 minutes, at which point only the edges were bubbling. I left them in for the full 14 minutes, and the middle was bubbling, too. When they cooled, the very outermost edges were hard and crunchy, and the middle was soft and chewy, but falling apart a bit. What did I do wrong/how should I fix it? I haven’t added the chocolate yet, which might bind it together, but the bottom of the bar is crumbling, too, so I’d have to encase the whole thing in chocolate. I’m thinking of maybe making a shortbread base, and gluing crumbles on top with the chocolate….